In 1962 a quite revolutionary new saloon was launched by BMC at the same time as the brand new MGB. Initially wearing the Morris badge, ADO16 was hot from the drawing boards of Alec Issigonis and Pininfarina. The Morris 1100 saloon was bristling with new technology and although the Mini had been launched very successfully in 1959, the 1100 was seen as offering quite a lot more for the money. Although similar in layout and concept to the Mini, none of the major components were carried over to the 1100, but in the reverse the Mini was to ultimately benefit from a modified version of the 1100's Hydrolastic suspension arrangement in 1964. As expected, in true BMC style the 1100 became the base for every marque that they owned and whilst it was anticipated that the next model to be released would be the Austin variant in fact it was the MG version that was launched in late 1962. 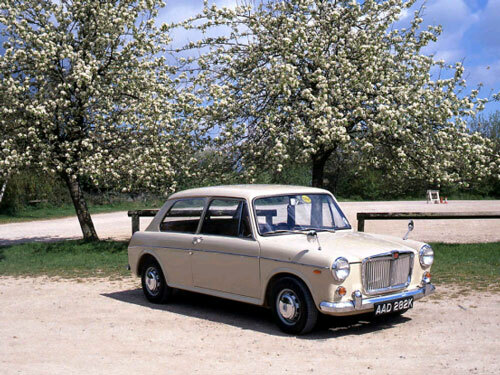 The Austin and Vanden Plas models came on the scene in late 1963 followed some two years later by the Riley and Wolseley offerings. The BMC 1100 based MG saloons were the top selling car in Britain for many years with over 3 million 1100/1300 variants being produced between 1962 and 1973. The 1100 was available in two door form initially with 4 door versions following later, as it was felt that two doors went better with the sporting MG image! Volkswagen had dominated the American small car market and this two door version was to spearhead the attack on this lucrative market. The MG Sports Sedan as it was known cost £949, however there was a problem identifying which market MG were aiming at, with literature and promotional films showing it as an ideal shopping car and at the other extreme, a car suitable for club racing. The car retailed steadily with nearly 28,000 being sold over a period of 5 years, but by 1967 the 1100 was beginning to look somewhat dated and its initial good performance, economy and handling were being overtaken by competitors. Shortly after the Mark II version was introduced in that year, the complete range of 1100 saloons were revised. The MG was given a face lift and uprated ready for the 1968 model year. New rear light clusters, ventilated pressed steel wheels and revised seating also extended into the Wolseley and Riley variants. The MG version now sported a 1275cc engine and was offered only with a two door body. The fascia and instrumentation was dramatically improved and although initially known as the MG 1275 it was soon adopted as the MG 1300 Mark I. The Mark II 1100 continued to be made and was available alongside the 1300 for a short period priced at £788 7s 9d. Four speed automatic transmission was an option on the new 1300, but in this case a single SU carburettor was used. In manual form the engine produced a healthy 75 bhp and closer ratio four synchromesh gearboxes were fitted to both the MG and Riley versions. The MG 1300 Mark I was available in manual form at £812 19s 5d whilst the automatic version cost £905 3s 2d. The model remained virtually the same until it was discontinued in 1971 in favour of the Austin/Morris 1300 GT, the only changes being in late 1968 when the Mark II version was introduced which adopted the Riley walnut veneer fascia panel that carried a revolution counter, speedometer, fuel, oil pressure and water temperature gauges, A smart leather covered three-spoked alloy steering wheel extended the sporting image whilst optional extras available were an electrically heated rear window and reclining front seats. Gearbox: Four speed, all synchromesh with remote control.